The National Governing Body for swimming, Swim England has developed a comprehensive National Plan for Teaching Swimming (NPTS). All our swimming instructors follow this plan and as such we offer the very best in swim tuition from encouraging non-swimmers to take their first splash to developing an advanced water competence. Stage 1: Developing basic safety awareness, the ‘class’ scenario, basic movement skills and water confidence skills. Stage 2: Developing safe entries to the water, including jumping in, basic floating, travel and rotation unaided to regain upright positions. Swimmers may use aids, e.g. arm bands, floats etc. 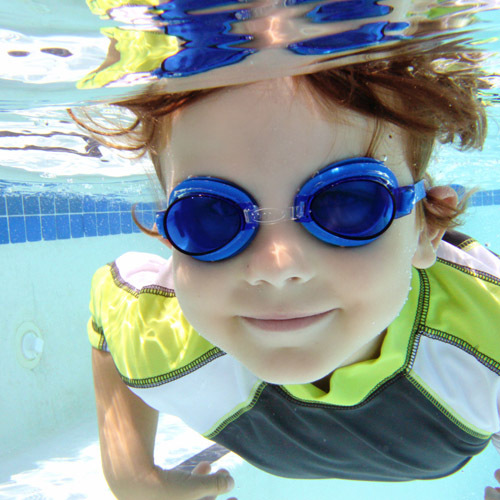 Stage 3: Developing safe entries including submersion, travel up to 10 metres on the front and back, progress rotation skills and water safety knowledge. Stage 4: Developing the understanding of buoyancy through a range of skills, refining kicking technique for all strokes, and swimming 10 metres to a given standard as directed by Swim England. Stage 5: Developing ‘watermanship’ through sculling and treading water skills, and complete rotation, also performing all strokes to the given standard as directed by Swim England. Stage 6: Developing effective swimming skills including coordinated breathing; developing the water safety aspects and understanding of preparation for exercise. Stage 7: Developing quality stroke technique up to 100 metres, incorporating skills learnt and combining them to develop a linked routine and complete successfully an obstacle course that combines a variety of skills accomplished throughout stages 1 – 7. Achieved Stage 7- Once swimmers have developed the core range of skills required to be confident, competent and safe in water through stages 1 – 7, there is a choice to then take part in a variety of different aquatic disciplines. All our lessons are 30 minutes in duration with a maximum of eight swimmers per group.